I'm not really one of those people who runs to trends and jumps on the bandwagon craze of any given item deemed the latest must-have by editors, street stylers and power bloggers alike. You know, the pieces that provoke style earthquakes thanks to the profuse instagramming, blogging and all around social media-ing. Their fall is usually as fast as their rise. In my younger days, I might have fallen victim to this type of circus, but as an oldie (I know, that's relative), I can't help but sometimes scoff at the hoards of lady followers that flock to the latest requisite piece in a way that isn't unlike devotees obeying orders from their cult leader. While my tone may have hints of condescension, I assure you that is not my intention. Everyone has their own path to follow and finding your style personality is a journey within itself that isn't meant to always be smooth sailing. Trend frenzies are also the nature of the business I chose to work in. If you don't engage in fashion experimentation, which, yes, at times means following the masses, how are you supposed to find yourself through clothes? How could you possibly figure out what works for you if you don't try out everything first? And then there finally comes a point where we all stop being impressionable and finally trust our gut. Quite the long preamble to come to following conclusion: it's not necessary to transform your entire wardrobe every season to follow trends. If you feel like you're stuck in some sort of wardrobe rut, or if you're in a financial bind but still in need of an update, or simply just not the trendy experimental type of person, the best way to look modern without overdoing it is with accessories and jewelry. When it comes to my own wardrobe choices, I tend to stick to a uniform of denim, t-shirts and sweaters, with slight variations here and there. But like any girl, I appreciate a good curveball and I certainly enjoy acquiring new stuff, so I'm going to share a little secret with you: the best way to dabble in trends without breaking the bank is by way of bling. The earrings du jour (not the designer option) will make you look on trend but not victim-y. If you're craving a little aesthetic restoration, all you need is to pick up the latest necklace (the budget version) and voilà, you feel like you're the one who should be photographed outside Lincoln Center. 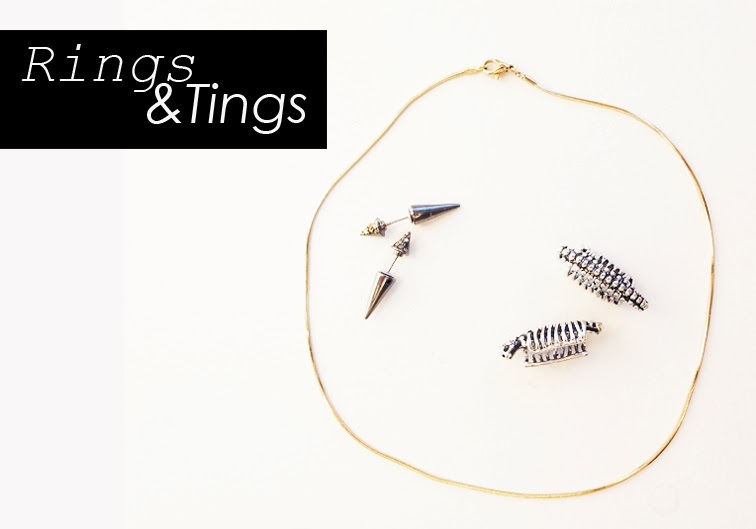 Just when I was yearning for a bit of a tweak, the lovely people at Rings & Tings kindly offered to send me some of their cool, on-trend pieces for me to wear and I instantly felt updated. Their stuff is sick and affordable, I can't even -- plus they ship worldwide. you MUST check them out! I've recently been leaning towards really simple jewelry, and these pieces are gorgeous! I agree that you don't have to change your entire wardrobe for every season..better to get creative! I like your word power blogger. I am with you. I am not chasing trends as well..
your new hair is very elegant! Loving the leather top and that lip color! Um WHAT, it's so affordable. Wasn't expecting that! I'm in love with the minimal gold tone necklace. Sold. I've never noticed before, but you look so much like Lady Gaga in all the photos where you're not angled straight toward the camera. Eyes, nose, chin all very similar. OMG!! Your hair is looking amazing!! Nice look and I like the purple lipstic, it adds a nice touch of color. Awesome!!!! I really like them. These pictures~!! You look INSANE!!! I srsly hope everyone is complementing you on your new do cause it's unreal. Totally brings out all your stunning features ;) Love the ear cuff!